Each year since 2003, the Agency for Healthcare Research and Quality (AHRQ) has produced the National Healthcare Quality Report and the National Healthcare Disparities Report. These reports to Congress are mandated in the Healthcare Research and Quality Act of 1999 (P.L. 106-129). Beginning with the 2014 reports, findings on health care quality and health care disparities are integrated into a single document. 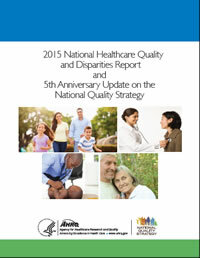 For the first time, this year's National Healthcare Quality and Disparities Report and National Quality Strategy Update is a joint effort addressing the progress made against the National Quality Strategy (NQS) priorities at the 5-year anniversary of the Strategy. The NQS is backed by the National Healthcare Quality and Disparities Report data. Integration of these two efforts within AHRQ supports the development of this more comprehensive report on the success of efforts to achieve better health and health care and reduce disparities. Select for print version (PDF, 3.24 MB). In addition, you may select separately the Introduction and Methods (PDF Version, 821 KB).